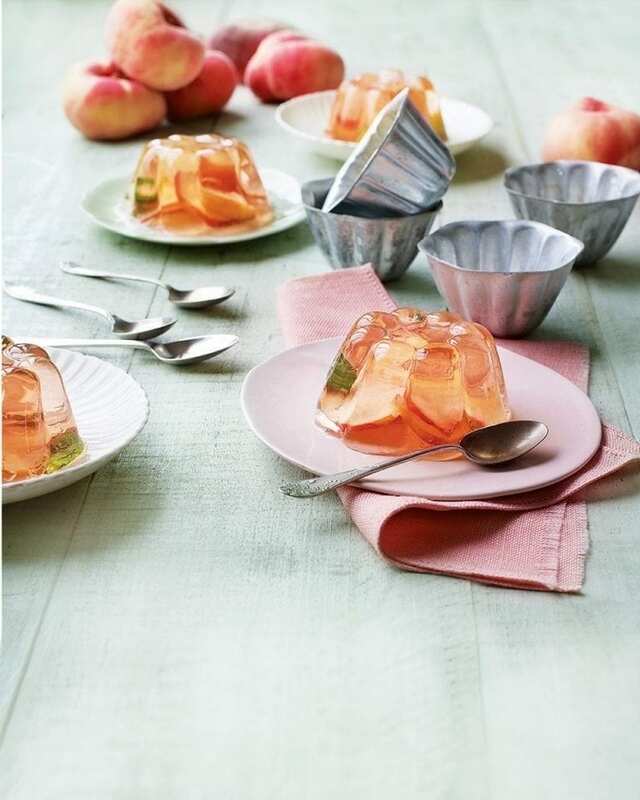 Elegant, individual jellies made with rosé wine, white peaches and elderflower cordial are a wonderfully light end to a summer dinner party. Put the gelatine leaves in a bowl and cover with cold water. Leave to soak for 5 minutes. Meanwhile, in a large measuring jug, combine the wine, juice, cordial and rosewater. Transfer a ladleful of the mixture to a small saucepan and heat until steaming, then turn off the heat. Squeeze out the excess water from the gelatine, then add to the pan and stir to dissolve. Pour the mixture into the jug with the remaining liquid. Grease the moulds lightly with oil. Put a few peach slices and a few mint leaves in each, then pour in the jelly. Chill for at least 4 hours or until set. Dip the moulds briefly into hot water, then invert onto plates to serve. If you find rosewater too strong, add less or leave it out. The jellies will keep chilled for up to 2 days, covered.